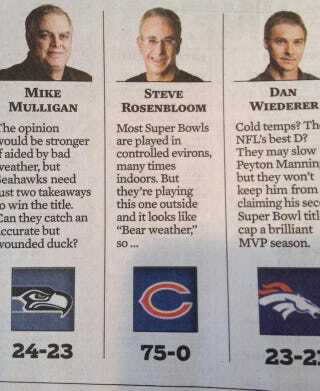 Chicago Tribune columnist Steve Rosenbloom doesn't even think it's going to be a close game either. He thinks the Bears are going clobber the ...well, it's unclear who, but whatever; he thinks they're going to win 75-0. Rosenbloom's tongue is pressing all the way through his cheek, so this isn't quite as bad as our doctor friend from yesterday, but hopefully no one's going to the Tribune for betting advice.